Neutrophils provide a critical defense against infection (1) by phagocytosis of microorganisms or extracellular killing via exocytosis of toxic granule effectors, sometimes in combination with the formation of extracellular traps (2). Blood neutrophils are commonly viewed as terminally differentiated effector cells with very limited capacity to stray away from a default program of activation/apoptosis, which they generally follow upon leaving the bone marrow. However, recent evidence suggests that profound changes in neutrophil survival and function can occur upon their recruitment from blood into diseased organs, as a result of permissive/stimulatory environmental conditions therein (3). In the fatal disease cystic fibrosis (CF), we previously demonstrated that neutrophils recruited from blood into the diseased airway environment undergo marked functional changes (4). In particular, CF airway neutrophils undergo active exocytosis of primary granules, leading to massive release of enzymes (e.g., elastase, myeloperoxidase) that damage the airway tissue and perpetuate inflammation. More intriguingly, we also observed that CF airway neutrophils express high levels of markers conventionally found on long-lived APCs, including class II MHC, the costimulatory molecule CD80, and the chemoattractant receptor of Th2 cells (CD294), all of which suggest profound reprogramming (4). CF airway neutrophils also undergo strong activation of CREB and mTOR prosurvival pathways (5). The CREB pathway is commonly induced in stress responses, as expected in the inflammatory environment of CF airways (6). However, the mTOR pathway is the main anabolic switch in eukaryotes and is generally associated with cell survival and growth (7). Therefore, its activation in catabolic neutrophils is rather perplexing. The mTOR pathway is responsive to extracellular insulin, as well as to extracellular nutrients, notably glucose (7) and amino acids (8). Both glucose (9) and amino acids (10) tend to accumulate in CF airway fluid as the result of an apparent failure of the epithelium, lacking functional CFTR protein, to transport these anabolic nutrients (11–13). Additionally, CF airway fluid is enriched in breakdown products of phosphonucleotides (14), which fuel cellular energy production. To investigate the process of metabolic adaptation by neutrophils recruited to CF airways, we used novel retroviral envelope glycoprotein (Env)-derived ligands (15, 16) combined with multicolor flow cytometry to characterize the expression of glucose/dehydroascorbic acid (Glut1), neutral amino acid (ASCT2), and inorganic phosphate (PiT1 and PiT2) transporters on CF blood and airway neutrophils. Using imaging flow cytometry (ImageStreamX platform; Amnis), we also characterized the expression and cytoplasmic localization of the conserved RNA-binding protein vigilin in blood and airway neutrophils. Vigilin has been associated with anabolic activity as a positive regulator of mRNA translation in multiple eukaryotic organisms, including humans (17–19). Simultaneously to vigilin, we characterized the expression of the LC3 protein, previously linked to multiple catabolic activities, including autophagy, phagocytosis, and the exocytosis of proteolytic enzymes (20–23). Our results demonstrate significant, distinctive metabolic changes among CF airway neutrophil subsets and suggest an important role for nutrient transporters in the inflammatory process observed in CF airway disease. This study received the approval of the Institutional Review Boards at Stanford University and Emory University. All subjects provided written informed consent before undergoing study procedures. Healthy control (HC) subjects (n = 13) were >18 years of age, with no restriction based on race or gender, excluding pregnant and breast-feeding individuals. CF was diagnosed by sweat chloride (>60 mEq/l), using a quantitative iontophoresis test and/or pre-existing documentation of two identifiable cftr mutations (see demographic data for CF subjects in Supplemental Table I, n = 24). The presence of common opportunistic pathogens in patient lungs was tested by routine sputum culture. Lung function was tested by spirometry, as per American Thoracic Society criteria. Blood (CF and HC subjects) and airway fluid (CF subjects only) were collected by venipuncture and sputum induction or spontaneous expectoration, respectively, and immediately placed on ice. Airway fluid was dissociated by addition of PBS-EDTA and repeated pipetting, a procedure that minimizes activation (4). Blood and airway fluid were centrifuged at 400 × g and 1500 × g for 10 min, respectively. The supernatant was removed, and the cell pellet was washed, resuspended in PBS-EDTA, and used immediately for glucose uptake, exocytosis, and cell sorting/quantitative RT-PCR assays. For analyses of nutrient transporter expression and vigilin and LC3 expression, blood and airway cells were fixed in Phosflow Lyse/Fix Buffer (BD Biosciences) to preserve leukocytes in their native state and stored at −80°C until use. Receptor-binding domains (RBDs) of gamma- and deltaretroviruses Env specifically interact with their cell surface receptor, all of which were shown to be metabolite transporters (24–27). In this study, we derived RBD ligands, as previously described (15), comprising the sequence encoding the 18–35 aa of the signal peptide with the corresponding RBD of the (i) 178 N-terminal amino acids of the human T cell leukemia virus type 2 (HTLV) Env, which is a ligand of Glut1 (glucose/dehydroascorbic acid transporter); (ii) 222 N-terminal amino acids of the RD114 (feline endogenous retrovirus) Env, which is a ligand of ASCT2 (neutral amino acid transporter); (iii) 253 aminoterminal amino acids of the koala endogenous retrovirus (KoRV) Env, which is a ligand for PiT1 (inorganic phosphate transporter); and (iv) 245 aminoterminal amino acids of the amphotropic murine leukemia virus (AMLV) Env, which is a ligand for PiT2 (another inorganic phosphate transporter). HTLV RBD was fused to the enhanced GFP (EGFP) at the carboxyl-terminal end, and all of the other RBDs were fused to either a specific mouse Ig-Fc tag (mFc) or rabbit Ig-Fc tag (rFc). The specificity of HTLV-RBD EGFP for Glut1 was established previously (15, 27–29). To assess the specificity of recognition of RD114-RBD mFc, KoRV-RBD mFc, and AMLV-RBD rFc for ASCT2, PiT1, and PiT2, respectively, we transduced CHO cells with the pLXSN vector containing an empty cassette or a cassette with the DNA sequence coding for human HA-tagged ASCT2, PiT1, or PiT2 (National Center for Biotechnology Information Reference Sequences: NM_001145144.1, NG_028281.1, and NC_000008.10, respectively). Following selection (G418 treatment for 15 d), staining of the parental and transduced CHO cells with the RBD ligands was assessed by flow cytometry (Fig. 1). Fixed frozen blood and airway cell samples were thawed, washed with PBS-EDTA, and surface stained at 37°C with two combinations of two RBD ligands: HTLV-RBD EGFP (Glut1)/KoRV-RBD mFc (PiT1) or RD114-RBD mFc (ASCT2)/AMLV-RBD rFc (PiT2). Although the HTLV-RBD EGFP ligand is inherently fluorescent, the other RBD ligands were used in a combination with fluorescently labeled Abs against mouse or rabbit IgG Fc (Life Sciences). Samples were also stained with cholera toxin B (Life Sciences); after a wash in PBS-EDTA and permeabilization with Perm I buffer (BD Biosciences), they were stained with the DNA-binding probe DRAQ5 (Life Sciences). The combination of cholera toxin B and DRAQ5 enables robust gating of live neutrophils from blood and airway samples (30), as illustrated in Supplemental Fig. 1A. Control stainings combined anti-mFc or -rFc with cholera toxin B and DRAQ5, in the absence of RBD ligands. After a final wash in Perm I buffer at room temperature, samples were analyzed on a LSR II flow cytometer (BD Biosciences), and expression of nutrient transporters was determined after fluorescence compensation (FlowJo software; TreeStar) (30). Data are reported as differential median fluorescence intensity (delta MFI) between the specific RBD staining and the corresponding background control for each individual sample. Glucose uptake was analyzed using the fluorescent glucose analog 2-[N-(7-nitrobenz-2-oxa-1,3-diazol-4-yl)amino]-6-deoxyglucose (2-NBDG; Cayman Chemical). Blood was treated with ammonium chloride to lyse RBCs, after which blood leukocytes were spun down and washed with PBS-EDTA. Leukocytes from blood and airway were prestained at 4°C with Live/Dead (Life Sciences) and anti-CD16 and -CD63 (both from BioLegend) to enable gating of live neutrophils (4). After a wash with PBS-EDTA, leukocytes were equilibrated in serum-free RPMI 1640 (Cellgro) at 4°C for ≥45 min. Leukocytes were then washed and resuspended in PBS, and 2.5 × 105 leukocytes were incubated for 1 min at 37°C with 2-NBDG at 100 μM (31). After a wash in PBS-EDTA, samples were analyzed on a LSR II flow cytometer, as above, and uptake was determined as delta MFI between 2-NBDG–stained and unstained conditions for each sample. Blood was treated with ammonium chloride to lyse RBCs and then spun down and washed with PBS-EDTA. Blood and airway leukocytes (1 × 106) were stained at 4°C with Live/Dead, anti-CD15 (BioLegend), anti-CD16 (BioLegend), and anti-CD63 (BD Biosciences) Abs to enable gating of live blood neutrophils (B: CD15hiCD16hi) and live airway neutrophil subsets (A1 subset: CD15hiCD16hiCD63lo; A2 subset: CD15hiCD16loCD63hi), as described previously (4, 5). After a wash with PBS-EDTA, blood and airway neutrophils were sorted with a FACS Jazz Cell Sorter using BD FACS Software (BD Biosciences). Nucleic acids from sorted blood and airway neutrophils were extracted using the QIAshredder kit (QIAGEN), and extracts were stored at −80°C until use. RNA isolation and genomic DNA removal were performed using RNeasy plus columns (QIAGEN), and the quality/quantity of RNA were determined using the ND-1000 spectrophotometer (NanoDrop Technologies). First-strand cDNA synthesis was carried out using Superscript II reverse transcriptase (Invitrogen), according to the manufacturer’s instructions. Specific paired primers (forward; reverse) were used to determine the levels of the following transcripts—Glut1 (5′-TGCTGATGATGAACCTGCTG-3′; 5′-GATGAGGATGCCGACGAC-3′), PiT1 (5′-CAGCGTGGACTTGAAAGAGG-3′; 5′-TGACGGCTTGACTGAACTGG-3′), and PiT2 (5′-TCTCATGGCTGGGGAAGTTAGT-3′; 5′-TTGCGACCAGTGAGAATCCTAT-3′)—and β-actin (ACTB) as the reference gene (32). Transcripts were amplified and measured using the ABI 7500 thermocycler with SYBR Select Master Mix (Life Sciences), according to the manufacturer’s instructions. Transcript levels were quantified relative to ACTB in each sample. Efficiency of RNA recovery per number of cells and number of cycles required for ACTB RNA amplification were equivalent for all sample categories (B, A1 and A2 sorted neutrophils), indicative of an absence of particular RNA degradation for the different subsets of neutrophils. Exocytosis (secondary and primary granules) and nutrient transporter surface expression were analyzed on blood neutrophils upon incubation with latrunculin B (LB) combined with the bacterial formyl peptide fMLF; LB and fMLF (both from Sigma-Aldrich) were prepared as 1000× frozen stocks in DMSO and diluted immediately prior to use. Blood was washed and resuspended in medium (serum-free RPMI 1640) at 5 × 106/ml and incubated with LB (1.25 μM) for 5 min at 37°C, followed by fMLF (5 μM) for 10 min at 37°C. In these conditions, primary and secondary neutrophil granules (and tertiary granules) are exocytosed to a large extent (33). Incubations were stopped by washing the cells with ice-cold PBS-EDTA and transferring tubes on ice. Samples were then stained at 4°C with Live/Dead and cholera toxin B to enable live neutrophil gating, as well as anti-CD66b (BioLegend) and anti-CD63 (BD Biosciences) to measure secondary and primary granule release, respectively (4). Samples were then fixed in Phosflow Lyse/Fix Buffer to preserve stained leukocytes, stored at −80°C, and thawed for batch staining with RBD probes and analysis of nutrient transporter expression, as described above. Fixed and frozen blood and airway cell samples were thawed, washed with PBS-EDTA, permeabilized with Perm I buffer (BD Biosciences), and stained with DRAQ5 and Abs directed against the nucleic acid–binding protein vigilin (Santa Cruz Biotechnology) and the autophagolysosome protein LC3 (MBL). The combination of LC3 and DRAQ5 also enables a robust gating of live neutrophils from blood and airway samples, as illustrated in Supplemental Fig. 1B. After a final wash in Perm I buffer, samples were analyzed on an ImageStreamX system (Amnis), and expression and localization (nuclear versus cytoplasmic) of vigilin and LC3 were quantified (IDEAS software) after fluorescence compensation (30, 34). Statistical analyses of flow and image cytometry datasets were performed using the JMP9 software (SAS Institute). Nonparametric statistics were used throughout the study, because flow and image cytometry data are generally not distributed normally. Differences were assessed using paired statistics (Wilcoxon signed-rank test) when comparing distributions between blood and airway neutrophils and unpaired statistics (Wilcoxon rank-sum test) when comparing data between groups (e.g., CF versus HC, treatment with given medications, male versus female, presence or absence of given bacterial infections, and genotype). Correlations between flow and image cytometry data and continuous demographic data (age) were assessed by the nonparametric Spearman test. Differences were considered significant at p < 0.05. When appropriate, Bonferroni corrections were applied according to the number of simultaneous outcome measures for each set of experiments. We demonstrated previously that the RBD from HTLV was a specific ligand for the glucose/dehydroascorbic acid transporter Glut1 (15, 28, 29, 35). Based on previously established binding specificities for the Env of RD114 (36), KoRV (37), and AMLV (24) for the human neutral amino acid transporter ASCT2 and inorganic phosphate transporters PiT1 and PiT2, respectively, we developed specific RBD ligands for each of these three human nutrient transporters. Env-derived RBD ligands for ASCT2 (Fig. 1A), PiT1 (Fig. 1B), and PiT2 (Fig. 1C) specifically stained CHO cells transduced with the corresponding human nutrient transporter. In contrast, no significant RBD ligand labeling was observed when CHO cells were transduced with an empty vector (negative control), confirming that none of the three corresponding Envs recognizes the endogenous hamster nutrient transporters (27). Additionally, there was no significant RBD ligand staining of CHO cells transduced with a noncorresponding human transporter, confirming the ligand-to-transporter specificity. Detection of nutrient transporter expression by RBD-derived ligands. CHO cells were transduced with either an empty LXSN vector or an LXSN vector coding for the human ASCT2 (A), PiT1 (B), or PiT2 (C) transporter. 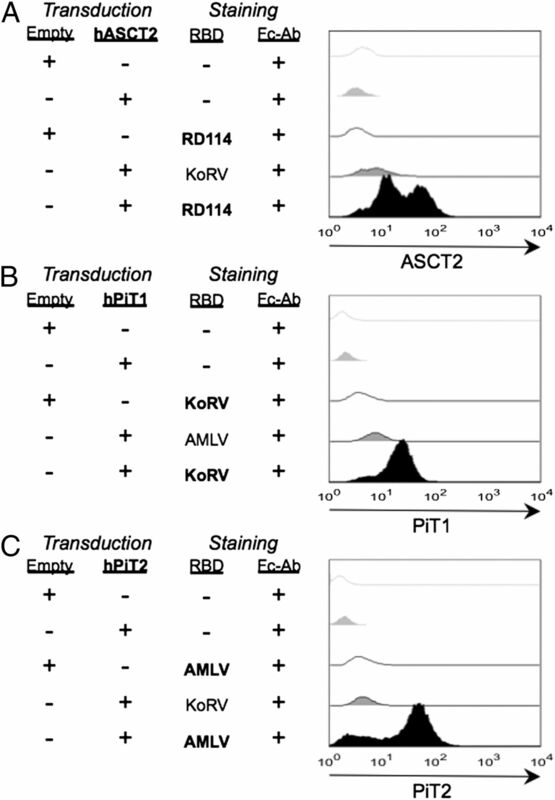 Control- and transporter-transduced cells were then stained with cognate RD114-, KoRV-, and AMLV-RBD ligands. Data are presented for negative controls (open gray graphs) and background controls (transporter-transduced cells stained with secondary Ab alone, filled gray graphs), as well as for control- and transporter-transduced cells stained with the specific RBD (open and filled black graphs). A hallmark of airway neutrophils in CF patients is a robust activation of the anabolic mTOR pathway (5), which responds to extracellular metabolites, such as glucose and amino acids, and induces ATP production (7). Hence, we investigated the expression of glucose, amino acid, and phosphate transporters on blood and airway neutrophils from CF patients. Staining with RBD ligands revealed significant expression of Glut1, ASCT2, PiT1, and PiT2 on neutrophils from both compartments (Fig. 2). Comparison of blood neutrophils from HC (n = 6) and CF (n = 6) subjects showed no significant difference in nutrient transporter expression (Fig. 3A). However, comparison of paired blood/airway samples from CF patients (n = 12) showed a marked upregulation of Glut1 and PiT1 on airway neutrophils compared with blood neutrophils (1.81- and 1.77-fold, respectively, Fig. 3B, Table I), whereas ASCT2 and PiT2 expression profiles appeared unchanged. We then assessed glucose uptake by blood neutrophils and airway neutrophils using the fluorescent d-glucose analog 2-NBDG (Fig. 4). Although glucose uptake was similar in HC and CF blood neutrophils, it was markedly increased in CF airway neutrophils. 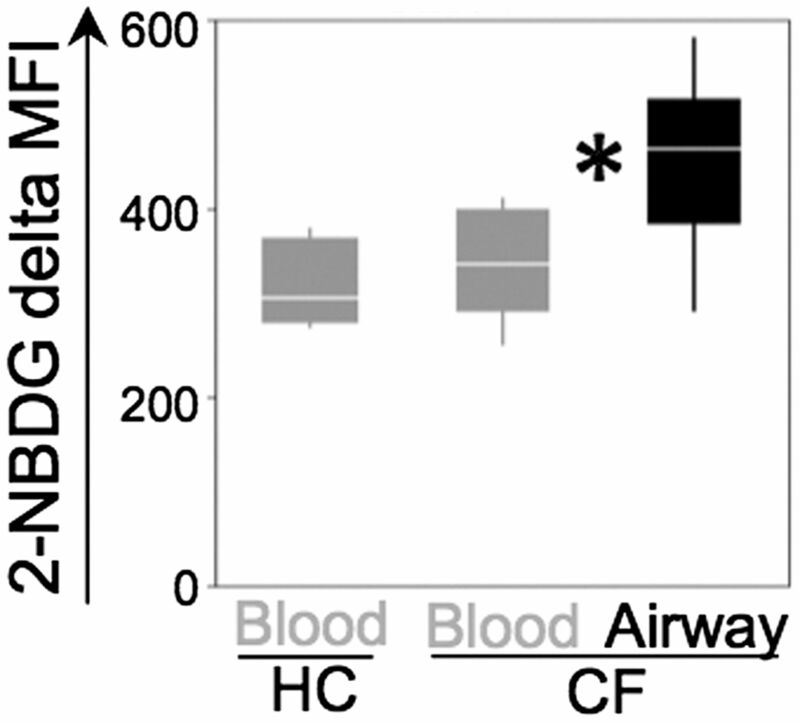 Thus, differences in baseline surface Glut1 levels between CF blood and airway neutrophils (Fig. 3B) translated into differences in glucose uptake (Fig. 4). 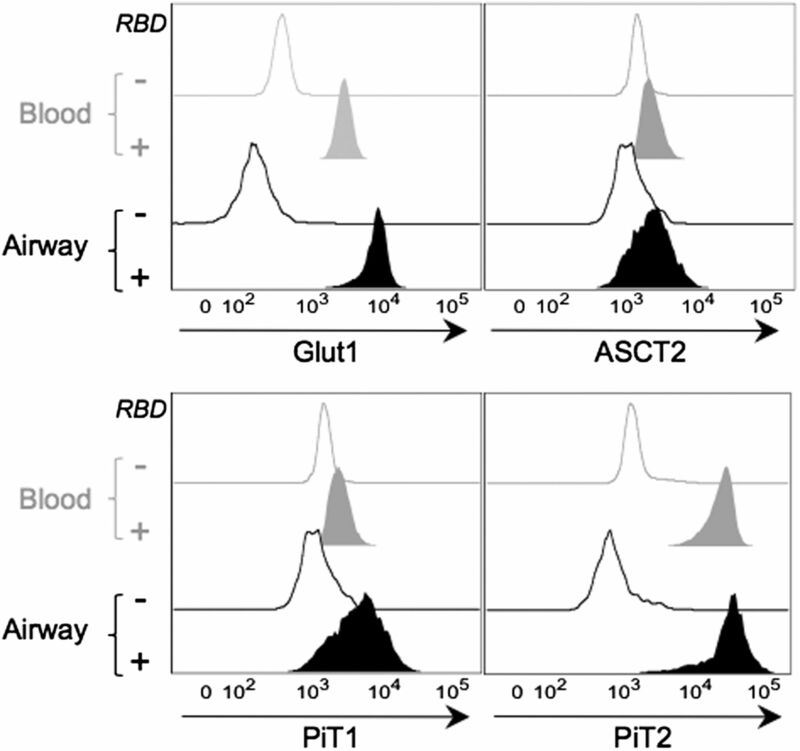 Expression of Glut1, ASCT2, PiT1, and PiT2 nutrient transporters on CF neutrophils. Blood and airway neutrophils from CF patients were stained with ligands for Glut1, ASCT2, PiT1, and PiT2. Representative graphs showing background (open) and specific RBD staining (filled) on blood (gray) and airway (black) neutrophils from a representative CF patient. Differences in nutrient transporter expression in CF and HC blood and airway neutrophils. Glut1, ASCT2, PiT1, and PiT2 expression levels (delta MFI) are presented as box plots (delimited by 25th and 75th percentiles, with median line, and 10th and 90th percentile bars). (A) Blood neutrophils from CF and HC subjects (gray, n = 6/group). (B) Blood (gray) and airway (black) neutrophils from CF patients (n = 12). *p < 0.05. Glucose uptake by blood and airway neutrophils. Glucose uptake in blood neutrophils from HC and CF subjects (gray) and CF airway neutrophils (black) was determined upon 1 min of incubation with the fluorescent d-glucose analog 2-NBDG. Box plots show the delta MFI (delimited by 25th and 75th percentiles, with median line, and 10th and 90th percentile bars) (n = 6/group). *p < 0.05. We showed previously that CF airway neutrophils can be split into two distinct subsets, designated as A1 and A2, based on low and high levels of exocytosis of toxic primary granules (and reflected by scatter properties), respectively (4). We found that these subsets also differed in their expression of nutrient transporters (Fig. 5). The A2 subset, which presented with higher levels of exocytic toxic granules according to scatter profiles (Supplemental Fig. 1), showed higher levels of Glut1 (1.29-fold, Table I) and more markedly increased levels of PiT1 (4.15-fold), PiT2 (3.59-fold), and ASCT2 (2.45-fold) compared with the A1 subset (Fig. 5, Table I). Although Glut1 was uniformly higher on airway neutrophils compared with blood neutrophils, regardless of the subset considered (A, A1, or A2), other nutrient transporters showed more complex patterns of modulation (Table I). Compared with blood neutrophils, ASCT2 expression was significantly lower on the A1 subset but was higher on A2 neutrophils (0.46- and 1.28-fold, respectively). This pattern was similar to that observed for PiT2 on airway neutrophils compared with blood neutrophils, with lower and higher expression on A1 and A2 neutrophils, respectively (0.38- and 1.30-fold, respectively). Thus, cell surface nutrient transporters in neutrophils that migrated from blood to the airways have patterns that distinguished the A1 and A2 neutrophil subsets. When assessing levels of Glut1, PiT1, and PiT2 transcripts in sorted blood (Supplemental Fig. 2), A1, and A2 neutrophil subsets, we found equivalent RNA recovery and actin RNA amplification, but no discernable increase in the transporter RNAs, despite increased surface expression. Rather, we noted a tendency for lower nutrient transporter transcript levels in airway versus blood neutrophils. Therefore, differences in transporter surface level expression are not reflected by synchronous modulation of the cognate transcripts. 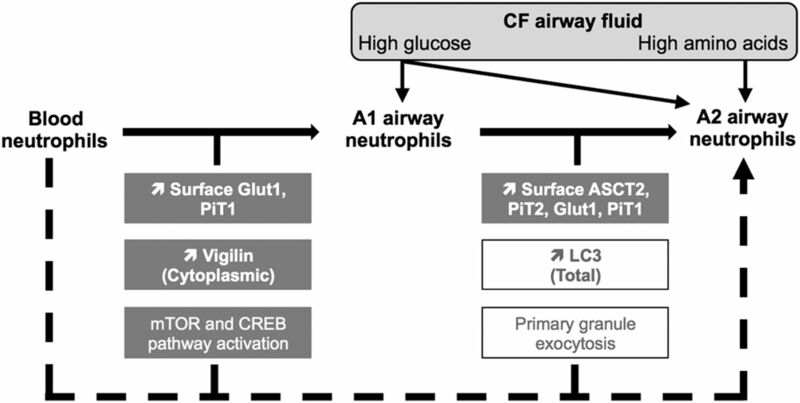 Modulation of nutrient transporter expression in the A1 and A2 subsets of CF airway neutrophils. 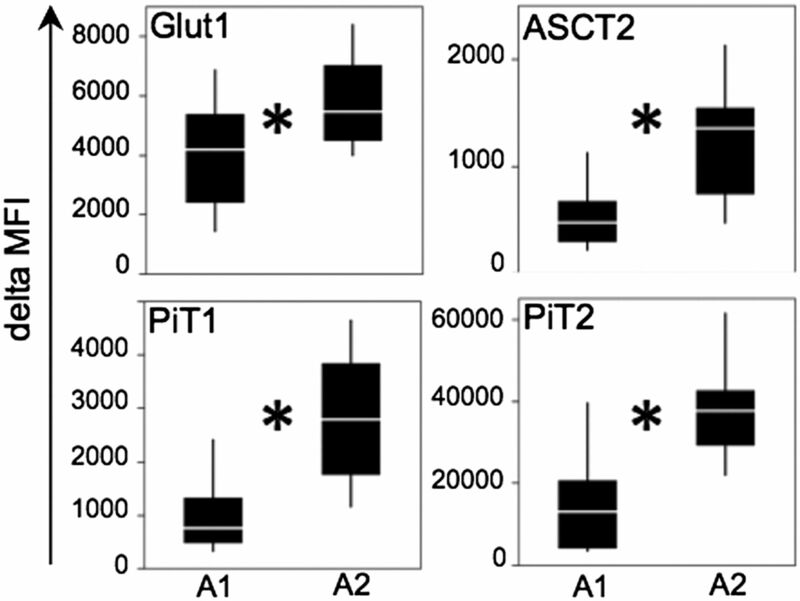 Glut1, ASCT2, PiT1, and PiT2 expression was assessed in the A1 and A2 airway neutrophil subsets from CF patients (n = 12). Box plots show the delta MFI (delimited by 25th and 75th percentiles, with median line, and 10th and 90th percentile bars). *p < 0.05. Oral steroids (OSs) are powerful inhibitors of inflammation, often used to curb acute symptoms of inflammatory airway disease in CF (6), and inhibition of Glut1 expression and its membrane localization are among the multiple parameters altered by OS treatment (38). Consistent with this mode of action, we observed that OS treatment significantly decreased Glut1, as well as PiT2, expression on CF blood neutrophils (Fig. 6). OS treatment did not significantly affect the upregulation of Glut1 expression on airway neutrophils. However, OS treatment significantly increased the proportion of the A2 subset, which expressed higher levels of PiT2 transporter than did the A1 subset (3.59-fold, Table I), thus increasing PiT2 expression among total CF airway neutrophils (A subset) in OS-treated versus untreated patients. No significant change was observed in either ASCT2 or PiT1 surface expression on blood and airway neutrophils upon OS treatment. Unlike OS treatment, other common modifiers of CF airway disease (genotype, age, gender, or Pseudomonas aeruginosa infection) did not affect nutrient transporter expression (data not shown). Modulation of nutrient transporter expression by OS treatment. Glut1, ASCT2, PiT1, and PiT2 expression in blood (gray) and airway (black) neutrophils was monitored as a function of OS treatment. Total airway neutrophil counts (NtCt, expressed as 106 cells/sample) and the percentage of A2 neutrophils present in the total airway neutrophil population were determined in CF patients undergoing OS treatment (+) versus untreated CF patients (-). Box plots show delta MFI (delimited by 25th and 75th percentiles, with median line, and 10th and 90th percentile bars) (OS treatment, n = 4; no treatment, n = 8). *p < 0.05. Compared with blood neutrophils, the A1 subset of CF airway neutrophils is characterized by a marked exocytosis of secondary granules (high CD66b with low CD63 surface expression), whereas the A2 subset is characterized by a marked exocytosis of both secondary and primary granules (high CD66b and CD63 surface expression) (4, 5). Because both subsets showed significant changes in nutrient transporter expression, we tested whether in vitro neutrophil activation and induction of granule exocytosis could alter surface expression of nutrient transporters. As previously reported (33), efficient secondary and primary granule exocytosis was triggered by the combined treatment with LB and fMLF and evidenced by marked increases in the CD66b and CD63 surface markers (5.66–6.87-fold and 23.74–29.4-fold, respectively, Supplemental Table II). In contrast, upon LB+fMLF treatment, nutrient transporter levels in HC and CF neutrophils remained within a range (0.61–1.67-fold) of those observed in control conditions. This range was markedly lower than that observed in vivo for the A2 subset, in which nutrient transporter expression ranged from 1.29- to 4.15-fold higher than in blood neutrophils (Table I). Of note, short-term incubation (10 min) of CF and HC blood neutrophils in CF airway fluid (cell- and bacteria-free) promoted changes in nutrient transporter expression that ranged from 0.96- to 1.5-fold (data not shown) lower that those observed for A2 cells in vivo. Thus Glut1, ASCT2, PiT1, and PiT2 are not components of neutrophil secondary and primary granules, and changes in their cell surface expression cannot be recapitulated by exocytosis of these granules or exposure to CF airway fluid in vitro. Vigilin is an RNA-binding protein with nuclear and cytoplasmic localizations, the latter being linked to anabolic activity in the form of increased RNA translation (17–19). Recent evidence from our group (J. Laval, M. Makam, D. Diaz, M. Preininger, M. Miglianico, L.A. Herzenberg, and R. Tirouvanziam, manuscript in preparation) and other investigators (39) suggests that CF airway neutrophils are transcriptionally and translationally active. In this study, we used image cytometry to monitor vigilin compartmentalization and observed a nuclear localization in CF blood neutrophils, although with a significant cytoplasmic translocation in airway neutrophils (Fig. 7). This translocation occurred in both the A1 and A2 subsets of airway neutrophils (7.58- and 4.89-fold compared with blood, Table I). Remarkably, expression of the catabolic protein LC3 (20–23) was increased markedly in the A2 subset of airway neutrophils (Fig. 7), but it was essentially unchanged in the A1 subset (2.1-fold compared with A1, Table I). Although vigilin and LC3 proteins could both be detected in the cytoplasm of CF airway neutrophils, they did not appear to colocalize (Fig. 7A). Taken together, our results suggest a complex process of neutrophil adaptation to the CF airway environment (Fig. 8). Expression and compartmentalization of vigilin and LC3 in CF blood and airway neutrophils. (A) Neutrophils from blood and airways (A1 and A2 subsets) were stained with Abs directed against the nucleic acid–binding protein vigilin and the autophagolysosome protein LC3, and with the DNA-binding DRAQ5 reagent. Colocalization was assessed on the ImageStreamX imaging flow cytometer (data acquired at original magnification ×40). Pseudocolor images show vigilin (top panels), DRAQ5 (middle panels), and LC3 (bottom panels) localization in a representative CF patient. (B) The percentage of cytoplasmic vigilin and total LC3 expression was compared between blood (gray) and airway (black) neutrophils (left panels), as well as between the A1 and A2 airway subsets (right panels) of CF patients (n = 14). *p < 0.05. In this study, we demonstrate marked changes in glucose, amino acid, and phosphate transporters among subsets of CF airway neutrophils. Using imaging flow cytometry, we further show that CF airway neutrophils express higher cytoplasmic levels of vigilin and LC3 compared with their blood counterparts, with significant differences among subsets for the latter. Together with our previous observation of sustained mTOR and CREB pathway activation in CF airway neutrophils (4, 5), these results suggest that neutrophils undergo significant metabolic adaptation as they are recruited to CF airways. Under the nutrient-rich conditions provided by the CF airway milieu (9, 11, 12, 14), environmental strains of autotrophic bacteria acquired by patients overcome the many negative aspects of this hypoxic and antimicrobial-, protease-, and oxidant-laden environment to thrive and undergo auxotrophic adaptation over time (10). Hence, the CF airway milieu exerts significant selective pressure on incoming bacteria, in large part through metabolic routes. Our results support the idea that inflammatory neutrophils recruited to the metabolically permissive CF airway milieu also undergo a metabolic adaptation. The significant increase in Glut1 surface expression and glucose uptake detected in airway neutrophils compared with blood neutrophils supports the notion that these cells are able to use the high amount of glucose in the CF extracellular milieu (9). This is consistent with our previous data on the immediate activation of the glucose-sensitive mTOR pathway in neutrophils recruited to CF airways (5). Studies by other groups clearly established that neutrophils are avid consumers of glucose (40) and that the upregulation of surface Glut1 expression is associated with neutrophil activation upon exposure to inflammatory conditions (41). A similar increase in glucose-dependent metabolism is seen in other activated leukocyte subsets, notably T and B cells (29, 42–45). 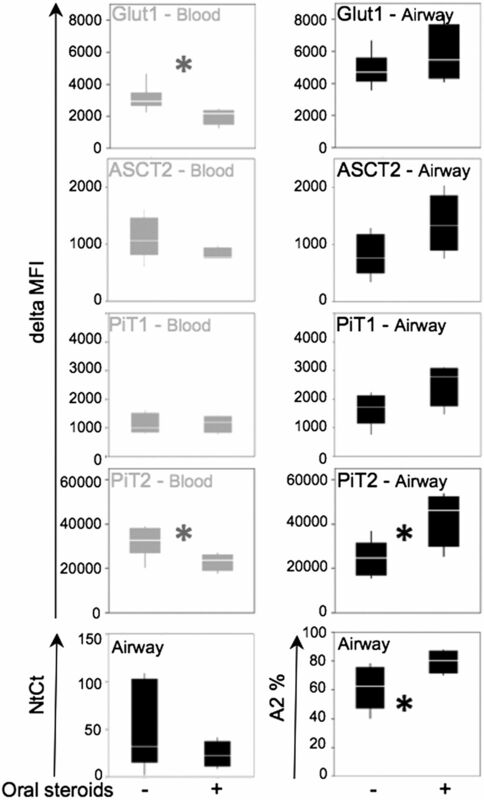 In contrast with Glut1, expression of the amino acid transporter ASCT2 is not uniformly increased on CF airway neutrophils (decreased on A1 and increased on A2 neutrophils compared with blood neutrophils, respectively). Because ASCT2 is required for sustained branched amino acid–dependent mTOR activation in anabolic cells (8), our findings suggest that, among CF airway neutrophils, glucose-driven and amino acid–driven anabolic activities may be regulated independently. 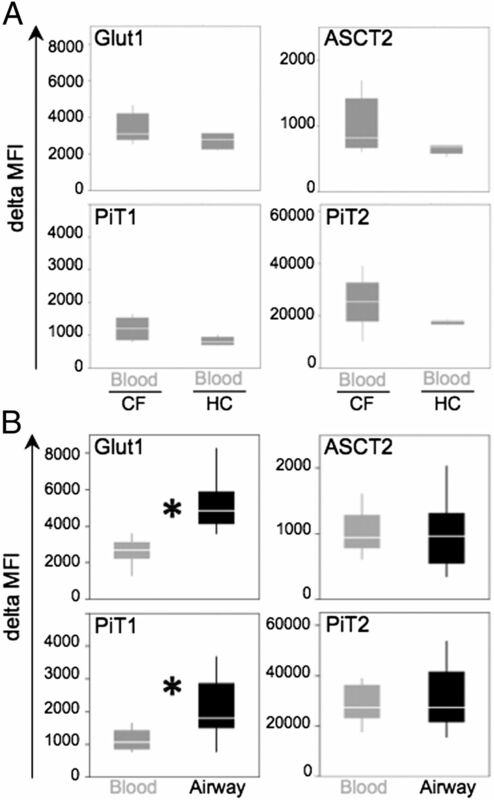 The absence of a marked difference in nutrient transporter expression between CF and HC neutrophils in blood suggests that, although chronic inflammation in CF patients may impact on the metabolism of circulating neutrophils, active recruitment to the airways seems to be required to fully promote anabolic adaptation. The RNA-binding protein vigilin undergoes a major relocalization from the nucleus to the cytoplasm upon neutrophil recruitment from blood into CF airways. Cytoplasmic vigilin plays a key role in mRNA stabilization and positively regulates translation, notably in response to stress (17–19, 46). Interestingly, we observed that CF airway neutrophils undergo marked changes in their transcriptional profile compared with CF blood neutrophils (Laval et al., manuscript in preparation), consistent with reprogramming (3, 39). Thus, the cytoplasmic relocalization of vigilin detected in all airway neutrophils (A1 and A2 subsets) is consistent with the notion that neutrophils are primed for anabolic activation following their entry into CF airways. In contrast, the increase in LC3 expression occurs only in A2 cells compared with blood neutrophils. This result is consistent with our observations of a major shift in primary granule exocytosis in the A2 subset (4) and with the recently proposed role for the LC3 protein in granulocyte exocytosis (21). Alternatively, the LC3 protein may be involved in other catabolic functions in these cells, including LC3-associated phagocytosis or even conventional autophagic activity (20, 22, 23). Interestingly, conditions inducing primary and secondary granule exocytosis, as produced by LB+fMLF treatment, did not induce nutrient transporter surface expression in the range observed in vivo. The lack of an obvious association between surface CD66b and CD63 and Glut1, ASCT2, PiT1, and PiT2 expression upon in vitro exocytosis is consistent with proteomic data, which did not identify nutrient transporters, such as Glut1, ASCT2, PiT1, or PiT2, in secondary and primary granules (47). Thus, these four nutrient transporters likely originate from other neutrophil compartments that are also subject to membrane mobilization. Rather than exocytosis processes per se, it is more likely that transepithelial migration, a process that induces strong signaling loops in migratory neutrophils and the surrounding tissue (48–50) and that was not reproduced in our in vitro activation assay, played a role in the induction of nutrient transporter surface expression. Consistently, in vitro incubation of blood neutrophils with CF airway fluid does not fully recapitulate this process. Additionally, changes in surface expression of these four nutrient transporters, as observed in vivo, did not appear to be due to changes in intracellular levels of the cognate mRNAs, consistent with the established notion that RNA transcription and protein expression are often asynchronous in neutrophils (3). Taken together, our data are consistent with a sequential model of neutrophil adaptation to the glucose- and amino acid–rich CF airway milieu. In the first step (blood → A1), neutrophils upregulate surface Glut1 and cytoplasmic vigilin expression, together with mTOR and CREB pathway activation (5). In the second step (A1 → A2), neutrophils further upregulate surface ASCT2, PiT1, and PiT2 and cytoplasmic LC3 expression, along with primary granule exocytosis (4). An alternative model, also compatible with our results, would consider A1 and A2 subsets to be mutually exclusive, rather than sequential adaptive states of CF airway neutrophils (blood → A1 and blood → A2). Both models are presented in Fig. 8. Schematic representation of neutrophil adaptation recruited from blood to CF airways. CF airways are rich in glucose and amino acids. Neutrophils recruited from blood into this pathological environment undergo complex adaptation, with changes in nutrient transporter expression and levels of LC3 and cytoplasmic vigilin (this study), as well as granule exocytosis (4) and mTOR and CREB pathway activation (5). Two models of cell differentiation from blood neutrophil phenotype to airway neutrophil phenotypes are represented: a model with sequential changes from A1 to A2 neutrophil subsets (solid arrows) and a model with a direct transition to either A1 or A2 subsets (dashed arrows). Further studies are needed to delineate the precise developmental relationships between these distinct neutrophil subsets. Longitudinal studies are also required to determine the potential associations between nutrient transporter expression and the severity of chronic and acute CF airway disease, as well as the effect of treatments. For instance, previous studies suggested that OSs significantly modulate Glut1 expression (38). In the course of the current study, we observed significant alterations in both Glut1 and PiT2 levels following OS treatment. Beyond CF, our findings indicate that the RBD ligands against surface-exposed Glut1, ASCT2, PiT1, and PiT2, and similar ligands derived from the Env of related retroviruses with high affinity for nutrient transporters, are likely to prove useful in investigating mechanisms of metabolic adaptation in response to inflammation and stress. J.L., J.-L.B., M.S., and R.T. are inventors on a provisional patent describing the use of RBD ligands for cell analysis in human inflammatory diseases (PCT/FR2010/051945 and PCT/EP2011/066231). The other authors have no financial conflicts of interest. We thank members of the Tirouvanziam Laboratory and V. Tangpricha at Emory University; C. Mongellaz of the Institut de Génétique Moléculaire de Montpellier; L. Oburoglu and members of the Taylor Laboratory; D. Giovannini and members of the Sitbon Laboratory; Y. Gernez, M. Makam, D. Diaz, and members of the Herzenberg Laboratory; the flow cytometry facilities at Emory University and Stanford University; the Montpellier RIO Imaging facility at the Centre National de la Recherche Scientifique/INSERM cluster; and the Production of Recombinant Proteins facility (Centre National de la Recherche Scientifique Montpellier) for support. We also thank J. Denner (Robert Koch Institut, Berlin, Germany) and F.-L. Cosset (Ecole Normale Supérieure, Lyon, France) for sharing KoRV and RD114 env plasmids, respectively, and D. Basiji, T. George, and R. Kong (Amnis) for help with running ImageStreamX analyses. This work was supported in part by the Fondation pour la Recherche Médicale (to M.S. ), the Association pour la Recherche sur le Cancer (to M.S. ), Agence Nationale de la Recherche GLUTStem (to N.T. and M.S. ), the American Cystic Fibrosis Foundation (to C.C. and R.T.), the Frank Foundation (to R.T.), and the Emory+Children’s Center for Cystic Fibrosis Research Startup Fund (to R.T.). J.L. was supported by Centre National de la Recherche Scientifique and the Fulbright Foundation, and N.T., J.-L.B., and M.S. were supported by INSERM.
. 2006. Systems biology of neutrophil differentiation and immune response. Curr. Opin. Immunol. 18: 54–60.
. 2008. Profound functional and signaling changes in viable inflammatory neutrophils homing to cystic fibrosis airways. Proc. Natl. Acad. Sci. USA 105: 4335–4339.
. 2009. Activation of critical, host-induced, metabolic and stress pathways marks neutrophil entry into cystic fibrosis lungs. Proc. Natl. Acad. Sci. USA 106: 5779–5783.
. 2000. Inflammation in cystic fibrosis and its management. Paediatr. Respir. Rev. 1: 101–106.
. 2011. An emerging role for TOR signaling in mammalian tissue and stem cell physiology. Development 138: 3343–3356.
. 2009. Bidirectional transport of amino acids regulates mTOR and autophagy. Cell 136: 521–534.
. 1996. The high amino-acid content of sputum from cystic fibrosis patients promotes growth of auxotrophic Pseudomonas aeruginosa. J. Med. Microbiol. 45: 110–119.
. 2003. Possible role of amino acids, peptides, and sugar transporter in protein removal and innate lung defense. Eur. J. Pharmacol. 479: 263–267.
. 2004. Double mechanism for apical tryptophan depletion in polarized human bronchial epithelium. J. Immunol. 173: 542–549. 2011. Mechanisms regulating airway nucleotides. Subcell. Biochem. 55: 17–49.
. 2004. HTLV-1 and -2 envelope SU subdomains and critical determinants in receptor binding. Retrovirology 1: 41.
. 2010. Regional characterization of energy metabolism in the brain of normal and MPTP-intoxicated mice using new markers of glucose and phosphate transport. J. Biomed. Sci. 17: 91.
. 2003. The multi-KH protein vigilin associates with free and membrane-bound ribosomes. Cell. Mol. Life Sci. 60: 2219–2227.
. 2004. Vigilin is co-localized with 80S ribosomes and binds to the ribosomal complex through its C-terminal domain. Int. J. Biochem. Cell Biol. 36: 1306–1318.
. 2011. Drosophila vigilin, DDP1, localises to the cytoplasm and associates to the rough endoplasmic reticulum. Biochim. Biophys. Acta 1809: 46–55.
. 2011. Phagosome dynamics during phagocytosis by neutrophils. J. Leukoc. Biol. 90: 271–284.
. 2011. An unexpected role for autophagy in degranulation of mast cells. Autophagy 7: 657–659.
. 2012. How nascent phagosomes mature to become phagolysosomes. Trends Immunol. 33: 397–405.
. 2012. Interactions of pathogenic bacteria with autophagy systems. Curr. Biol. 22: R540–R545.
. 1996. Receptor-binding properties of a purified fragment of the 4070A amphotropic murine leukemia virus envelope glycoprotein. J. Virol. 70: 4387–4393.
. 2003. The ubiquitous glucose transporter GLUT-1 is a receptor for HTLV. Cell 115: 449–459.
. 2001. Receptors and entry cofactors for retroviruses include single and multiple transmembrane-spanning proteins as well as newly described glycophosphatidylinositol-anchored and secreted proteins. Microbiol. Mol. Biol. Rev. 65: 371–389 (table of contents).
. 2005. HTLV-1 tropism and envelope receptor. Oncogene 24: 6016–6025.
. 2005. Human T cell leukemia virus envelope binding and virus entry are mediated by distinct domains of the glucose transporter GLUT1. J. Biol. Chem. 280: 29025–29029.
. 2007. Isolated receptor binding domains of HTLV-1 and HTLV-2 envelopes bind Glut-1 on activated CD4+ and CD8+ T cells. Retrovirology 4: 31. Tirouvanziam, R., D. Diaz, Y. Gernez, J. Laval, M. Crubezy, and M. Makam. 2011. An integrative approach for immune monitoring of human health and disease by advanced flow cytometry methods. In Advanced Optical Flow Cytometry: Methods and Disease Diagnoses. V. Tuchin, ed. Wiley-VCH Verlag, Wienheim, Germany, p. 333–362.
. 1996. Intracellular fate of 2-NBDG, a fluorescent probe for glucose uptake activity, in Escherichia coli cells. Biosci. Biotechnol. Biochem. 60: 1899–1901.
. 2005. Selection of reference genes for gene expression studies in human neutrophils by real-time PCR. BMC Mol. Biol. 6: 4.
. 2008. Primary granule exocytosis in human neutrophils is regulated by Rac-dependent actin remodeling. Am. J. Physiol. Cell Physiol. 295: C1354–C1365.
. 2006. Quantitative measurement of nuclear translocation events using similarity analysis of multispectral cellular images obtained in flow. [Published erratum appears in 2009 J. Immunol. Methods 344: 85.] J. Immunol. Methods 311: 117–129.
. 2008. Erythrocyte Glut1 triggers dehydroascorbic acid uptake in mammals unable to synthesize vitamin C. Cell 132: 1039–1048.
. 1999. The RD114/simian type D retrovirus receptor is a neutral amino acid transporter. Proc. Natl. Acad. Sci. USA 96: 2129–2134.
. 2006. In vitro characterization of a koala retrovirus. J. Virol. 80: 3104–3107.
. 1996. Dexamethasone modulates insulin receptor expression and subcellular distribution of the glucose transporter GLUT 1 in UMR 106-01, a clonal osteogenic sarcoma cell line. J. Mol. Endocrinol. 17: 7–17.
. 2008. Neutrophils in cystic fibrosis display a distinct gene expression pattern. Mol. Med. 14: 36–44.
. 2007. Glucose metabolism in lymphoid and inflammatory cells and tissues. Curr. Opin. Clin. Nutr. Metab. Care 10: 531–540.
. 2007. Glucose transporter expression on the plasma membrane of resting and activated white blood cells. Eur. J. Clin. Invest. 37: 282–290. Loisel-Meyer, S., L. Swainson, M. Craveiro, L. Oburoglu, C. Mongellaz, C. Costa, M. Martinez, F. L. Cosset, J. L. Battini, L. A. Herzenberg, et al. 2012. Glut1-mediated glucose transport regulates HIV infection. Proc. Natl. Acad. Sci. USA. 109: 2549–2554.
. 2003. The HTLV receptor is an early T-cell activation marker whose expression requires de novo protein synthesis. Blood 101: 1913–1918.
. 2005. Glucose transporter 1 expression identifies a population of cycling CD4+ CD8+ human thymocytes with high CXCR4-induced chemotaxis. Proc. Natl. Acad. Sci. USA 102: 12867–12872.
. 2008. Cell surface expression of the bovine leukemia virus-binding receptor on B and T lymphocytes is induced by receptor engagement. J. Immunol. 181: 891–898.
. 2010. Vgl1, a multi-KH domain protein, is a novel component of the fission yeast stress granules required for cell survival under thermal stress. Nucleic Acids Res. 38: 6555–6566.
. 2005. Proteomic analysis of human neutrophil granules. Mol. Cell. Proteomics 4: 1503–1521.
. 2011. Neutrophil transmigration triggers repair of the lung epithelium via beta-catenin signaling. Proc. Natl. Acad. Sci. USA 108: 15990–15995.